A latest advertisement with name as Zila Panchayat Alirajpur Recruitment has been published by Zila Panchayat Alirajpur to inform the Motivated & dynamic Job finders for the 02 positions of Data Entry Operator. Eligible Candidates can apply for Zila Panchayat Alirajpur vacancy by submitting application form through offline mode before the end date which is 8th December 2017. Education Needed: Job searchers should have Graduation Degree (BCA / BS.c-IT) / Post Graduation Diploma or equivalent examinations from any recognised institute. Contenders who are interested to apply for any of the above mentioned positions they should be in between 18 to 45 Years as on 01-01-2017. Salary Package: Candidates who will be recruited successfully they will get attractive and satisfying salary of Rs. 17,300/- from Zila Panchayat Alirajpur. First of all contenders visit the official website which is http://www.alirajpur.nic.in. Last Date to Submit Filled-In Application : 08-12-2017. Check Zila Panchayat Alirajpur Recruitment Notification Here. Roads and Bridges Development Corporation of Kerala Limited has strewed A latest job notification as RBDCK Recruitment to inform the Result oriented and skillful Indian Nationals for the 20 vacant posts of Accounts Assistant, Manager, Senior Manager. Eligible Job seekers can apply for RBDCK vacancy by submitting their prescribed application form on or before the end date that is 4th December 2017. Eligibility Criteria: Job finders should have passed Bachelor Degree / B.Com/B.Tech (Civil) / Master Degree / MBA with good academic records from well recognized Institute / board. Salary Details: Successfully recruited applicants for Accounts Assistant, Manager, Senior Manager will attain attractive and impressive salary of Rs. 77,400 - 1,15,200/- (Post 1), Rs. 13,610 - 20,700/- (Post 2), Rs. 36,600 - 79,200/- (Post 3), Rs. 39,500 - 83,000/- (Post 4), Rs. 42,500 - 87,000/- (Post 5), Rs. 9,190 - 15,510/- (Post 5), Rs. 5,650 - 8,790/- (Post 7), 20,000 - 45,800/- (Post 8,9) from organization. Contender will be recruited against this recruitment on the basis of their performance in Written Exam / Interview which is about to be conducted by the recruitment committee of organization. First of all appliers you have to open the official site of the organization that is http://www.rbdck.com. End Date To Submit Hard Copy of Application Form Is : 04-12-2017. Check RBDCK Recruitment Notification Here. Government Medical College & Hospital has published A current advertisement with name as GMCH Recruitment. Organization invites online Applications from Skilled & well qualified Applicants in order to hire up 59 vacant posts of Senior Resident, Demonstrator, edical Officer in different departments. Qualification Details: Job finders should have passed Post Graduation Degree / Diploma /Post Graduation Medical Degree (M.D/M.S./M.D.S/D.M./M.CH/DNB) / MBBS with good academic records from well recognised Institute. Candidates applying for any aforesaid post and belongs to All Other category shall be required to pay an application fee of Rs. 500/-. Applying candidates should not be exceeding than 33 Years (For Post 1-4), 30 Years (For Post 5-7) as on 01-01-2017. Visitors have to visit the Official Website to apply for GMCH and that is http://www.gmch.gov.in. This will open a list of the links having latest openings and candidates have to select the most appropriate link which will open the complete advertisement having further details regarding GMCH Vacancies. Candidates should take a printout of the submitted application form and Send the application completed in all respects to the address mentioned below till the closing date. Closing Date For Apply Online : 04-12-2017. Last Date to Submit Filled-In Application : 06-12-2017. Date for Written Examination : 12-12-2017. Check GMCH Recruitment Notification Here. A current advertisement with name as Office of the Panchayat Samiti Recruitment has been liberated by Office of the Panchayat Samiti to inform the The most eligible and effective Aspirants for the 16 posts of Jogan Sahayak. Eligible Contenders can apply for Office of the Panchayat Samiti vacancy by submitting their prescribed application form on or before the end date that is 22nd December 2017. Eligibility Criteria: Job seekers should have completed the education as 10th with good academic records from well recognized Board/ University/ Institute as per the applied posts. Contenders who are interested to apply for any of the above mentioned positions they should be in between 21 to 45 Years as 22-11-2017. Monthly Remuneration: Successfully appointed contenders against this recruitment will attain salary of Rs. 5000/- from recruiting organization. Contenders will be hired against this recruitment on the basis of their performance in Merit Basis that will be conducted by selection committee of recruiting organization. Job seekers are interested to apply for above mentioned positions firstly they need to go through the official website that is http://www.ordistportalcontent.nic.in. Application Has To Be Sent Latest By : 22-12-2017. Check Office of the Panchayat Samiti Recruitment Notification Here. Individuals can also get latest updates about Office of the Panchayat Samiti Vacancies by bookmarking this page using CTRL+D. A job notification regarding District Court Korea Recruitment has been circulated by District Court Korea to inform the Goal oriented and skilled Indian Nationals for the 46 positions of Stenographer, Assistant. Eligible Jobs Hunter can apply for District Court Korea vacancy by submitting their applications through offline mode till the last date that is 15th December 2017. Education Needed: Aspirants must have Graduation Degree / Diploma (Computer Application) and MS word from well recognized Board/ University/ Institute according to post. Emoluments: Contenders that get shortlisted after qualifying the selection process will get Rs. 5200 - 20,200/- With 2800/1900/- Grade Pay as per organization norms. Assortment of job finders for above posts will be based on their appearance in Skill Test and Merit List which will be conducted by District Court Korea on stipulated date. The Last date For Acceptance of Application Forms : 15-12-2017. Check District Court Korea Recruitment Notification Here. Guru Teg Bahadur Hospital is looking for the Hard working and result oriented Contenders to the engagement of 64 positions of Senior Resident. 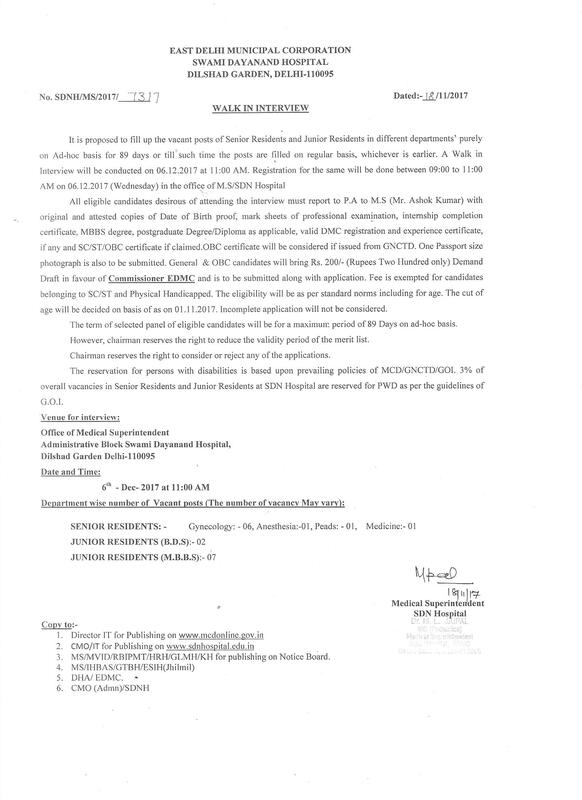 Recently, Guru Teg Bahadur Hospital has liberated A job notification in regard to GTBH Recruitment. To complete this recruitment process Contestants who want to make their career in government sector jobs may attend walk-in interview on 29th November 2017 at the given venue. Qualification Details: Job seekers should have completed the education as Post Graduation Degree / DNB / PG Diploma / MBBS with good academic records from well recognised University/ Institute as per the applied posts. Pay Band for Guru Teg Bahadur Hospital jobs: Successfully recruited candidates will receive salary of Rs. Rs. 67,700/- from recruiting organization. Firstly, approach on web portal of GTBH that is http://www.delhi.gov.in. Walk in Interview Held On : 29-11-2017. Check GTBH Recruitment Notification Here. A newest career related advertisement titled as Collector Office Sikar Recruitment has been published by Collector Office Sikar to inform the Result oriented and skillful Indian Citizens for the 33 Vacancies of Junior Technical Assistant, Account Assistance. Eligible Job seekers can apply for Collector Office Sikar vacancy by submitting application form through offline mode till the closing date that is 8th December 2017. Qualification Required: Job finders should have passed B.E. / B.Tech (Civil, Agriculture Engineering) / Diploma (Civil) / B.Com / C.A. intermediate (IPC) / ICWA (Inter) / Company Secretary (Inter) with good academic records from well recognized Institute / board. Contenders who want to join this organization they should be in between 21 to 35 Years As on 01-01-2018. What amount I’ll get as pay band? : Contenders that get shortlisted after qualifying the selection process will get Rs. 13,000/- (Post 1), Rs. 8000/- (Post 2) as per organization norms. Visit the web portal of organization which is http://www.sikar.rajasthan.gov.in. Last date to submit application form : 08-12-2017. Check Collector Office Sikar Recruitment Notification Here. Institute for Social and Economic Change has professed A job advertisement in regard to ISEC Recruitment. Organization invites online recruitment application from Achievement oriented and skilled Job seekers for the engagement of 03 vacant posts of Research Fellow, Research Assistant in various departments. Academic Details: Those candidates are having minimum qualification as Candidates who are willing to apply for ISEC jobs must posses Bachelor Degree / M.Sc (Natural Science with plant taxonomy background/ Forestry/Environmental Economics/Agriculture Economics) / Master Degree (forestry/environmental sciences/Botany) from any recognized board or institution can apply. Candidates who want to apply for ISEC vacancy they are required to go through the official website of organization that is http://www.isec.ac.in. Once the application form filled successfully Job seekers should send application form, documents and certificates at the email address well sited below. Closing Date to Send Copy of Application Form Is : 10-12-2017. Check ISEC Recruitment Notification Here. A vacancy advertisement titled as WBPHIDCL Recruitment has been strewed by West Bengal Police Housing & Infrastructure Development Corporation Limited to inform the Diligent and dynamic Individuals for the 09 vacant positions of Executive Engineer, Sub Assistant Engineer. Eligible Job appliers can apply for WBPHIDCL vacancy by submitting application form through offline mode before the time limit that is 15th December 2017. Education Info: Job searchers should have B.E. / B.Tech. / B.Sc. (Engineering civil) / Diploma (Civil Engineering) or equivalent examinations from any recognised institute. Contenders who want to join this organization they should be in between 31 to 62 Years (Post 1), 21 to 36 Years (Post 2,3). Salary & Pay Band: Successfully recruited candidates will receive salary of Rs. Rs. 39,000/- (Post 1), Rs. 27,000/- (Post 2), Rs. 20,000/- (Post 3) from recruiting organization. First and foremost step you have to take is for opening the official site, which is http://www.policewb.gov.in. Deadline for Receiving Hard Copy of Application Form Is : 15-12-2017. Check WBPHIDCL Recruitment Notification Here. Central Selection Board is looking for the Eligible and hard working Contestants to fill 60 unoccupied posts of ANM, Laboratory Technician, Steno Typist. Recently, Central Selection Board has dispersed A vacancy notification in regard to CSB Recruitment. To complete this recruitment process Job finders who think themselves eligible for said posts may attend walk-in interview on 4th December to 11th December 2017 at the given venue. Qualification: Job searchers should have 12th / Diploma (Radiographer / Laboratory Technician / Stenographer / Nursing) or equivalent examinations from any recognized board / institute. Age of applying candidates must be between 18 to 43 Years. Firstly, approach on web portal of CSB that is http://www.csbbodoland.in. Walk In Date : 04-12-2017 to 11-12-2017. Check CSB Recruitment Notification Here. Central Selection Board is looking for the Capable and Motivated Job seekers for the 15 Vacancies of Health Educator, NMA. Recently, Central Selection Board has liberated A newest career related advertisement in regard to CSB Recruitment. To complete this recruitment process Job finders who wish to grow their career in government sector can attend walkin interview on 1st December 2017 at the given venue. Eligibility Criteria: Candidates must have completed the 12th / Diploma (Computer) / Graduation Degree or its equivalent with good marks from a recognized University / Institution. Contenders who are interested to apply for any of the above mentioned positions they should be in between 18 to 43 Years. Selection of applicants for Health Educator, NMA Will be based on Written Exam / Interview. First of all, aspirants have to visit the web portal of organization that is http://www.csbbodoland.in. Date for the Walk In Interview : 01-12-2017. A latest job notification regarding NGRI Recruitment has been transmitted by National Geophysical Research Institute. Enthusiastic and talented Participants can submit their applications through online mode for the 35 vacant positions of Project Assistant, Project Scientist on or before the end date that is 4th December 2017. Eligibility Criteria: Candidates must have completed the Master’s Degree (Geology / Geophysics / Applied Geology/ Geochemistry & specialization in Micro-paleontology) / Ph.D (Geophysics / Geology / Geophysics / Geology / Remote Sensing) or its equivalent with good marks from a recognized University / Institution. Applying candidates Age must not above than 30 years (Post-1), 40 years (Post 2. Pay Band for National Geophysical Research Institute jobs: Those contenders who will fulfill the required eligibility criteria for NGRI Vacancies will get a monthly consolidated of Rs. 25000/-(Post 1), Rs. 48200/-(Post 2) as per the rules of the organization. First and foremost step you have to take is for opening the official site, which is http://www.ngri.org.in. Commencement of Online Application Form Is : 22-11-2017. Check NGRI Recruitment Notification Here. Bhiwandi Nizampur Municipal Corporation is looking for the Brilliant and qualified Applicants to fill 77 vacant positions of Medical Officer, ANM, Lab Technician. Recently, Bhiwandi Nizampur Municipal Corporation has released A vacancy notification as BNMC Recruitment. To complete this recruitment process Jobs Hunter who want to grab this jobs opening can attend walkin interview on 27th November to 29th November 2017 at the given venue. Qualification Required: Aspirants must have MBBS Degree / 10th / A.N.M. Nursing Course / B.Sc With D.M.L.T. / D.Pharm from well recognized Board/ University/ Institute according to post. Maximum age limit for the applying candidates is 45 Years (Post 1,2), 38 Years (Post 3-5). Pay Band for Bhiwandi Nizampur Municipal Corporation jobs: Contenders that get shortlisted after qualifying the selection process will get Rs. 45,000/- (Post 1), Rs. 28,350/- (Post 2), Rs. 8640/- (Post 3), Rs. 8400/- (Post 4), Rs. 10,000/- (Post 5) as per organization norms. Visitors have to visit the Official Website to apply for BNMC and that is http://www.bncmc.gov.in. Date of Interview : 27-11-2017 to 29-11-2017. Check BNMC Recruitment Notification Here. Bhopal Sahakari Dugdha Sangh Maryadit has issued A vacancy advertisement regarding MPCDF Recruitment. The organization invites online applications from Result oriented and skillful Aspirants for the engagement of 02 posts of Trainer in different departments. Essential Qualification: Aspirants must have Graduation Degree (Veterinary Science/ Animal Science/ Agriculture) from well recognized Board/ University/ Institute according to post. Age of applying candidates must be between 21 - 35 years as on 31-10-2017. Salary to Employees: Applicants who will be appointed against this recruitment they will attain consolidated salary of Rs. 20,000/‐ from recruiting organization. First of all, aspirants have to visit the web portal of organization that is http://www.mpcdf.nic.in. Once the application form filled successfully Aspirants should send the application form along with documents to the email address that is mentioned below. Closing Date to Send Copy of Application Form Is : 23‐11‐2017. Check MPCDF Recruitment Notification Here. Applicants can also get latest updates about MPCDF Vacancies by bookmarking this page using CTRL+D. Vardhman Mahavir Medical College is looking for the Ambitious, fascinated and proactive Candidates to the engagement of 07 vacant positions of Data Entry Operator, Technician, Nurse. Recently, Vardhman Mahavir Medical College has circulated A job notice in regard to VMMC Recruitment. To complete this recruitment process Applicants who wish to grow their career in government sector can attend walkin interview on 24th November 2017 at the given venue. Qualification Details: Job searchers should have 12th (Science) / Diploma (Medical Laboratory Technician) / ANM Certificate / Graduation Degree (Science) or equivalent examinations from any recognized board / institute. Applying candidates should not be exceeding than 30 Years. Pay Scale: Successfully recruited applicants for Data Entry Operator, Technician, Nurse will attain attractive and impressive salary of Rs. 18,000/- (Post 1), Rs. 17,000/- (Post 2) from organization. Visit the web portal of organization which is http://www.vmmc-sjh.nic.in. Walk In Date : 24-11-2017. Check VMMC Recruitment Notification Here. A current advertisement for SCPS Recruitment has been issued by State Child Protection Society. Enthusiastic and talented Participants may fill online application form for the 76 vacant posts of Social Worker before the end date which is 30th November 2017. Essential Qualification: Those candidates are having minimum qualification as Candidates who are willing to apply for SCPS jobs must posses Graduation Degree (Social Work/ Sociology/ Psychology/Education/ Home Science / Diploma / PG Diploma / Certificate in Child Protection or Child Development from any recognized board or institution can apply. Upper age limit of applicants applying for this recruitment will be 45 Years As on 01-11-2017. Pay Scale: Those contenders who will fulfill the required eligibility criteria for SCPS Vacancies will get a monthly consolidated of Rs. 14,000/- as per the rules of the organization. Selection of applicants for Social Worker Will be based on Written Exam / Interview. First of all appliers you have to open the official site of the organization that is http://www.jobs.scpsbihar.in. Dead Line For Apply Online : 30-11-2017. Check SCPS Recruitment Notification Here. Candidates can also get latest updates about SCPS Vacancies by bookmarking this page using CTRL+D. Sri Venkateswara Institute of Medical Sciences University is looking for the Desirous and brilliant Indian Citizens for filling up 04 unoccupied posts of Traineeship, Studentship. Recently, Sri Venkateswara Institute of Medical Sciences University has professed A job advertisement in regard to SVIMSU Recruitment. To complete this recruitment process Applicants who want to make their career in government sector jobs may attend walk-in interview on 22nd November 2017 at the given venue. Qualification Details: Aspirants must have Post Graduation Degree (M.Sc. Bioinformatics) from well recognized Board/ University/ Institute according to post. Applying candidates should not be exceeding than 28 Years As on 30-11-2017. Monthly Remuneration: Successfully recruited applicants for Traineeship, Studentship will attain attractive and impressive salary of Rs. 8000/- from organization. First of all, aspirants have to visit the web portal of organization that is http://www.svimstpt.ap.nic.in. Date of Interview : 22-11-2017. Check SVIMSU Recruitment Notification Here. East Delhi Municipal Corporation is looking for the Eligible and well talented Job seekers for filling up 18 Vacancies of Senior Resident, Junior Resident. 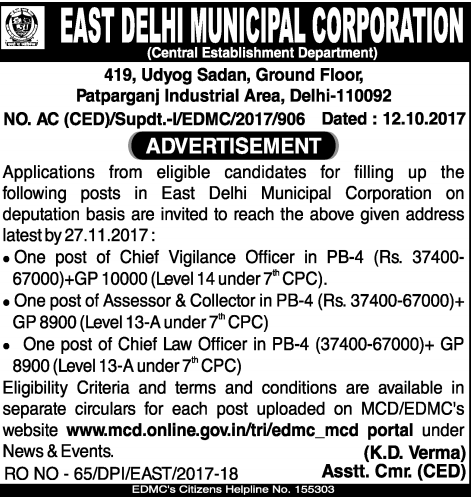 Recently, East Delhi Municipal Corporation has dispersed A latest career related advertisement as EDMC Recruitment. To complete this recruitment process Participants who desire to grasp Jobs in Govt Sector can attend walkin interview on 6th December 2017 at the given venue. Required Qualification: Candidates must have completed the MBBS Degree / Post Graduation Degree / Diploma or its equivalent with good marks from a recognized University / Institution. Candidates who want to apply for EDMC vacancy they are required to go through the official website of organization that is http://www.mcdonline.gov.in. Walk In Date : 06-12-2017. Check EDMC Recruitment Notification Here. 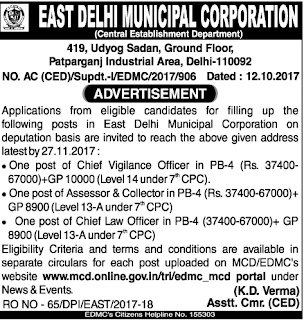 East Delhi Municipal Corporation has issued An employment advertisement in regard to EDMC Recruitment to inform the Achievement oriented and skilled Indian Nationals for the 03 positions of Chief Vigilance Officer, Assessor and Collector. Eligible Job finders can apply for EDMC vacancy by submitting their prescribed application form till the closing date that is 27th November 2017. Qualification: Candidates must have completed the Master Degree or its equivalent with good marks from a recognized University / Institution. Salary Package: Applicants who will be appointed against this recruitment they will attain consolidated salary of Rs. 37,400 - 67,000/- With 10,000/8900/- Grade Pay from recruiting organisation. Firstly, approach on web portal of EDMC that is http://www.mcdonline.gov.in. Application Has To Be Sent Latest By : 27-11-2017. An employment notification for Chennai Port Trust Recruitment has been dissipated by Chennai Port Trust to inform the Goal oriented and skilled Candidates for the 01 vacant posts of Chief Engineer. Eligible Aspirants can apply for Chennai Port Trust vacancy by submitting application form till the closing date that is 21st December 2017. Qualification Required: Job finders should have passed Engineering Degree (Civil Engg) with good academic records from well recognized Institute / board. Age of aspirants applying for above Vacancy must be above 45 Years As on 01-12-2017. Salary Structure: Candidates who will be recruited successfully they will get attractive and satisfying salary of Rs. 51,300 - 73,000/- from Chennai Port Trust. First of all contenders visit the official website which is http://www.chennaiport.gov.in. This will open a list of the links having latest openings and candidates have to select the most appropriate link which will open the complete advertisement having further details regarding Chennai Port Trust Vacancies. Last Date for the Submission of Application : 21-12-2017. Check Chennai Port Trust Recruitment Notification Here. A job advertisement in regard to Chennai Port Trust Recruitment has been dissipated by Chennai Port Trust to inform the Goal oriented and skilled Indian Nationals for the 01 posts of Traffic Manager. Eligible Job appliers can apply for Chennai Port Trust vacancy by submitting their applications through offline mode till the closing date that is 29th November 2017. Required Education: Candidates must have completed the Graduation Degree or its equivalent with good marks from a recognized University / Institution. Applying candidates should not be exceeding than 45 Years. Salary Details: Shortlisted aspirants for Traffic Manager will receive pay scale of Rs. 51300 - 73000/- which is offered by Chennai Port Trust. Deadline to Submit the Application Is : 29-11-2017. A vacancy advertisement with name as CGWB Recruitment has been declared by Central Ground Water Board to inform the Capable and Motivated Aspirants for the 12 vacant positions of Assistant. Eligible Participants can apply for CGWB vacancy by submitting application form before the time limit that is 2nd January 2018. Education Info: Job finders should have passed Master Degree (Meteorology / Physics / Applied Physics / Geo-Physics / Mathematics / Statistics) with good academic records from well recognized Institute / board. Monthly Remuneration: Candidates who will be recruited successfully they will get attractive and satisfying salary of Rs. 9300 - 34,800/- With 4800/- Grade Pay from CGWB. First of all contenders visit the official website which is http://www.cgwb.gov.in. Once the application form filled successfully Aspirants should submitted to the address tuned below till date of closing that is tuned below. Last Date of Receipt of Applications : 02-01-2018. Check CGWB Recruitment Notification Here 1. Check CGWB Recruitment Notification Here 2.